Named after the Scott family who arrived in the area around 1850. 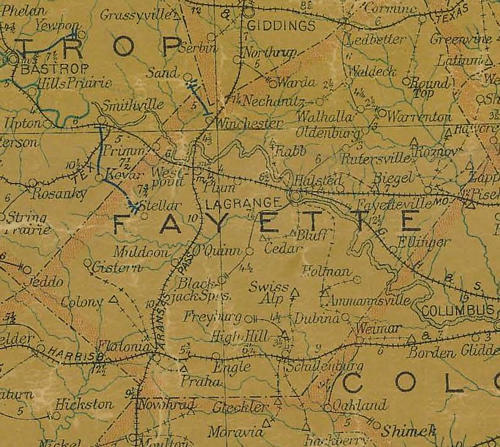 Early settlers were a combination of Anglo, German and Czechs, including the Freytag and Maeker families, who came in 1868, the Wiedemanns in 1871, followed by Welhausens, Muellers, Wotipkas, Schutz, Boehms, Spanns, Castlemans, Richters, Darileks, Koenigs, Niemanns, Giesbers, Flatos, Fehrenkamps, Wiedemanns and others. 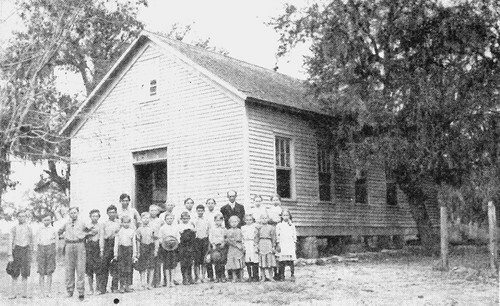 Since there was no school in the area, the old Arizaba school house from Cedar Springs was moved near P.W. Scott�s home in 1882. In 1885, a new school was built; it was enlarged to a two�room school in 1920 and remodeled again in 1940; it closed in 1952 when it consolidated with Flatonia schools. Adam Schutz built a cotton gin with stone; it was powered by a steam engine; the building is still used as a barn on the old Joe Svatek place. He also owned a dance platform with music provided by a large hand organ brought in on a wagon. W. Richter built the Rocky Creek Brewery south of the gin. A Mr. Jones operated a hand pump gas station into the 1930s. A Baptist church was established on the old Charlie Flato farm; other churches in the area served the residents. The Old Flatonia Cemetery lies about two miles from the above-mentioned places. Rustler�s Hill west of the community was a notorious hideout for cattle rustlers.